What would be the most appropriate way to fix this? Can I "patch" the holes with caulk or do I really need to remove what's there now and reapply? What type of caulk do I need? How do I make sure there is not moisture being sealed in? Also, what is the name of this type of material covering the wall around the inside of the tub/shower area? It feels thin and kind of plastic-y. I tried to describe it to someone and realized that I do not know what it's called. This looks like this is one of those re-lined tubs. Get that caulked in as soon as possible. I don't mean to be an alarmist, but I am surprised that the sidewalls are set behind the tub's top edge, not over the tubs edge. The way this is now, relies only on the integrity of the caulk to keep the water out from the actual tub under the liner, where it would be trapped. Would you be able to have the tub area redone? If that is not possible, practically any hardware store, big or small will have a mildew resistant caulk that will take care of the immediate problem. Do remove the old caulk by carefully cutting the openings that are there bigger with out scratching the plastic tub or wall liner. 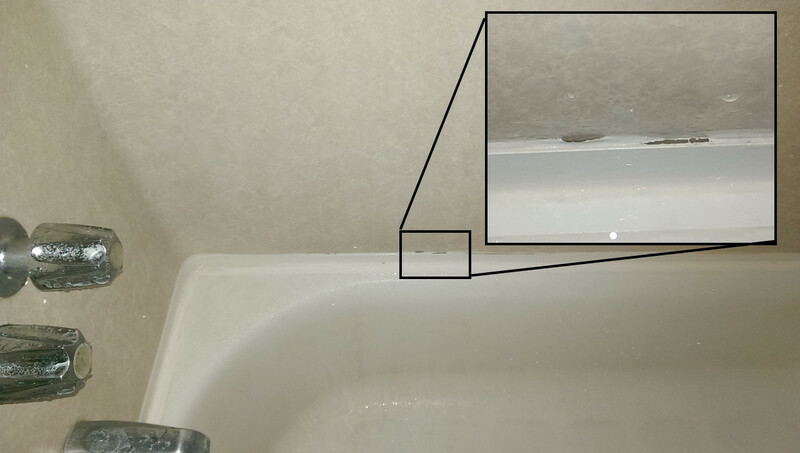 One more thing is to keep water in the tub when you caulk until the caulk dries. It's a pain to work this way, but flex in the floor under the tub when there's weight in it can help open up a gap in the caulk over time if it was caulked with no weight in the tub. Given that your caulk is doing a critical job it shouldn't have to do means you don't want to miss a trick. You definitely do not want water getting behind or under the tub. It creates a superb natural habitat for mold and rot. Long term, it would be best to install a tub surround (or equivalent) that correctly overlaps the lip of the tub. Jack and Ecnerwal are both right in that the wall should overlap the tub. Your caulk probably failed prematurely because of the excessive runoff on it (and it is a bad caulk job). What would I do? Strip out all caulk. Then make sure that I fill the gap between wall and tub with Silicone. I would level the Silicone off at tub lip. Then I would recaulk using a mold resistant caulk on top of silicone. The caulking should not be applied as high (thick) as shown in your picture or it just won't last. That said, if recaulking best results are from removing the old caulking first and redoing the whole job. Not the answer you're looking for? Browse other questions tagged bathroom bathtub caulking caulk or ask your own question. Do I have to remove all caulk before reapplication? How should I caulk aluminum capping where it meets brick? Do I really need to fill the tub with water? How long does caulk need to dry in a 1" gap?